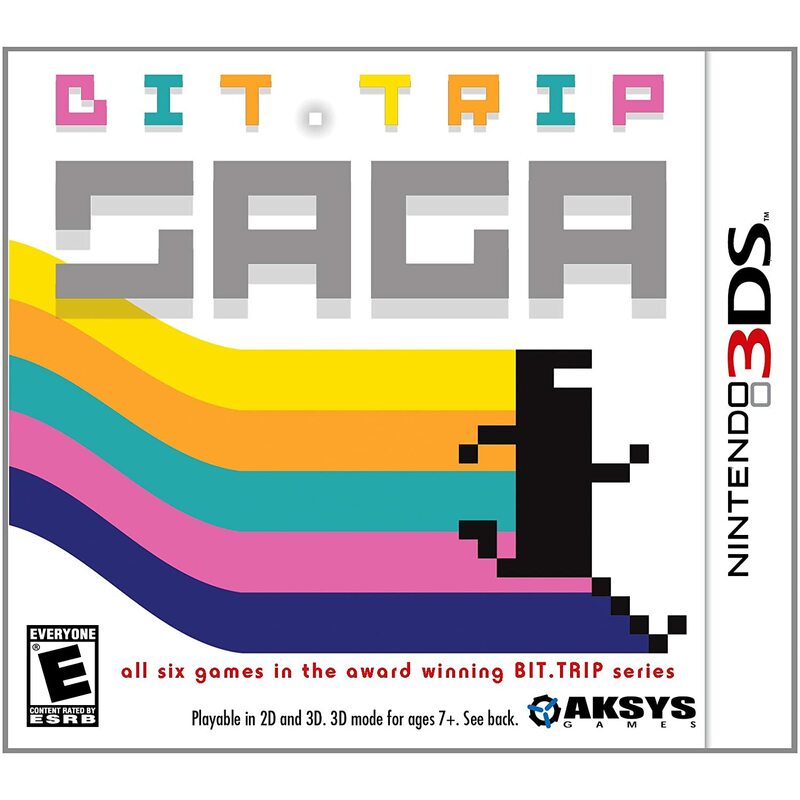 When rumor of the BIT.TRIP series coming to 3DS started trickling out, a lot of people got excited, including myself. Having played and beaten each game on the Wii, the prospect of having all six games in one package on the go sounded like an awesome idea in theory. Does Commander Video's complete odyssey work well on the 3DS? Box art courtesy of Amazon. Secret_Tunnel wrote a great story analysis for the whole series, so read that if you want insight into Commander Video's journey. I can say that all of the cutscenes are in place and have been rebuilt in 3D. BIT.TRIP BEAT plays like Pong. Move your paddle up and down (with the stylus or the analog slider) to hit each of the beats before they go past you to earn points, add to the music, and chain a multiplier. This game has three stages. BIT.TRIP CORE moves you to the center of the screen. Shoot the bits before they cross your path to earn points, add to the music, and chain a multiplier. This game has three stages. BIT.TRIP VOID gives you full control over your directions. Move your circle in all directions with the analog slider to collect black bits (and expand in size), avoid white bits, and release to decrease in size. The more bits you collect and successfully release, the higher your score and multiplier get. This is also the first game in the series to allow continuing from checkpoints. This game has three stages. BIT.TRIP RUNNER is arguably the most well-known in the series. Commander Video runs from left to right, and it's up to you to help him kick, block, and dodge all manners of obstacles. Collect all of the gold bars (a reference to Pitfall!) in a stage to access a short bonus level. This game has thirty-three stages, thirty-three bonus stages, and three boss stages. BIT.TRIP FATE is, literally, an on-rails shooter. Move Commander Video back and forth with the analog slider and shoot by holding the touch screen in the direction that you want Commander Video to shoot. Enemies will drop plusses for you to collect, adding to your score and increasing your multiplier. You can also increase your firepower by running into one of Commander Video's friends. This game has six stages. BIT.TRIP FLUX is a celebration of the series. It plays a lot like BIT.TRIP BEAT, but the beats come from the left side of the screen instead of the right. The added challenge also makes every beat white, not giving any visual clues as to what you need to do. Fortunately, there are plenty of checkpoints in case you fail. This game has three stages. Screen courtesy of Zelda Informer. Control-wise, all six games are pretty different but they all work pretty well. My only recommendation would be to use the stylus for BEAT and FLUX instead of the analog slider. The analog slider is definitely usable, but the stylus is much more precise in my experience. My biggest problem with SAGA is with its graphics, especially in 3D. Yes, it does look good with the 3D on, and it makes it easier to distinguish beats from the background (something that was tough to do in the original BEAT). However, when the screen starts to get occupied with objects, the framerate gets bogged down, and it's very noticeable, especially in RUNNER and FATE. With RUNNER, FATE and FLUX, the framerate is no better with the 3D off at times. Fortunately, the music never lags (except in RUNNER, but it quickly corrects itself when it does) despite this. I recommend you plug in the headphones when you play this one. The 3DS' speakers don't do the game justice. The music and sounds are simply fantastic and need to be heard, so crank up the volume and get lost in SAGA's world. One downer is the lack of BIT.TRIP COMPLETE's extra challenges and online leaderboards. Those would have been a great addition to SAGA, but Gaijin Games didn't include them in this package. It would have been fun to compare my scores to those of my friends right from my 3DS. This is the closest thing to an official trailer that I could find. It applies to both SAGA and COMPLETE. Video courtesy of NintendoLife via YouTube. Despite the lack of features and the occasional graphical hiccups, BIT.TRIP SAGA is a great compilation and is worth the price admission. It's got something for just about everyone. Thanks for the review! Even though I've poured hours into this collection already in BIT.TRIP COMPLETE, I wouldn't mind having all the games on my 3DS as well. That's cool the 3D makes it easier to distinguish beats from the background, but it's too bad the framerate takes a hit, even with 3D off. I'll pick this one up in like ten years when I've all but forgotten about BIT.TRIP. Get it now. It's only $22 on Amazon. Yeah, it felt "rushed" in that sense. It's odd that the framerate took noticeable hits at times, though Gaijin did a good job of making sure the music corrected itself when it needed to. WUT? 22 bucks is a steal! I wanna get this game for a friend who's new to the series. Hey, thanks for the review ludist. I'm curious how BEAT and FLUX play with the stylus controls. The stylus controls make the games much easier than they were on WiiWare. I could easily best my high scores using the stylus, and even the tough levels (read: Growth) were much more manageable.